Is it real ? Is it recall? JohnnyTwoToes tells you all about this sci-fi 90s reboot! As Hollywood gets around to remaking EVERY film ever made, I suppose it was only a matter of time before they came up with the remake of Total Recall. Now, I can say director Len Wiseman had a tall order to fill with this remake based on the classic sci-fi hit from 1990 with Schwarzenegger. While critics and many fans may not agree at all, Wiseman does a decent job although the scriptwriters have taken out a key plot point that made the original work so well. Colin Farrell plays Douglas Quaid who is so bored with his life in the mines and his beautiful wife, Lori (played by Mrs. Len Wiseman, Kate Beckinsale) that he goes into Rekall for a little excursion in his mind as a secret agent. As most know who have seen the original, he actually is an agent but for whose side? 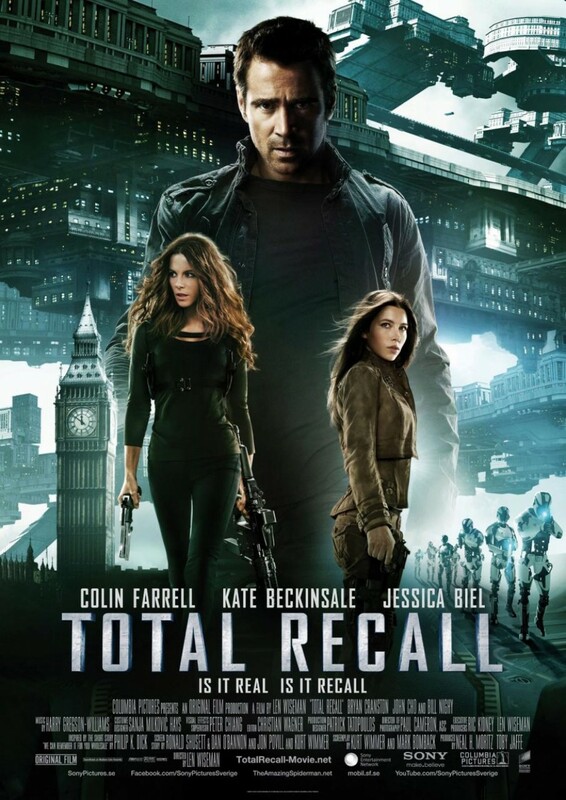 This Total Recall is not nearly as good as its predecessor, but that was not to be expected, at least by me. I mean did any one watch the Underworld movies? So, ok, this Total Recall can stand on its own merit as its own film. It is not a bad film, has some nice changes and kept me interested. Never mind the fact that they have completely written out Mars and the hoarding of oxygen that worked to well in the original. Still it has some fine acting and the script by Kurt Wimmer and Mark Bomback has some good lines worth remembering. Any movie that has both Kate Beckinsale AND Jessica Biel can't be THAT bad. Bryan Cranston (TV's Breaking Bad and Drive) is an odd choice for Cohaagen. He is a phenomenal actor but here he is not seen in the flesh until almost 80 minutes into the film. You see him a couple of times on a TV screen but he is not interacting with anyone until the film enters its fourth act. When we do see him, he looks like the weather man on channel 5 news at 10; complete with a tie, Kevlar vest and a quasi bouffant hairdo. He is decent as Cohaagen but I missed the original villians - Ronny Cox and Michael Ironside. Total Recall is fun to watch and the visuals are stunning. I respected their way of trying to do something different and found their approach.....well.....ballsy. When you have a classic film directed by Paul Verhoven, starring an icon like Schwarzenegger and great bad guys like Ronny Cox and Michael Ironside and you take a giant leap like Wiseman and the writers have done with this film; I tip my hat. Yes, in the days of Hollywood remaking classics this one is decent. I would recommend the director's cut which has about 15 to 20 minutes of additional footage that really enhances the story. Total Recall is gutsy, fast, stylish and who knows? Maybe in twenty to twenty-five years maybe they will try to remake this version of Total Recall. Stranger things have happened. Total Recall-*** out of 4.